Former rider Colin Richardson responds to Ken Nicholson's recent article - Ever Decreasing Circles and explains why race times haven't decreased to the extent that may have been expected. Robert J. Rogers looks back on the pre-war exploits of the famous Wembley Lions. Robert J. Rogers has been delving through his photo album and put together this interesting collection of Wembley related speedway photographs. The collection includes pictures of the Lions as well as from the famous Wembley world finals of yesteryear. "Never really thought about it as Havvy was not at his peak when I've seen him racing. However, from what I've read it's clear that he had the ability and motivation to go out and do it when it really mattered. How many guys have we all seen who've been given the title of "best never to win the World Title" (the list is endless) but here is a guy who went out and did it when they got the/their only chance - I doff my titfer to you Havvy, you did it when others made reasons for certain riders NOT doing it!" "Gary Havelock actually started - as have so many in British Speedway - in junior grasstrack. British speedway should help sponsor grasstrack, kick down some Sky money to the folks who have provided them with so much talent. " "Totally agree with the sentiments. I saw Bjorn win the world title at Wembley, and have never since heard a crowd roar as it did that night. It appeared as if everybody in the stadium was supporting him. One of the most stylish riders I have ever seen. Seeing him come out of a bend, leaning low off the bike with his left leg tucked behind the front wheel was awesome." "Split Waterman told me that he designed the Winged Wheel trophy. He made it in his sheet metal workshop at Harringay Stadium. He would also like it returned to him. I wonder if Ivan Mauger would like to comment on this?" "I would like to endorse the views of John Skinner. 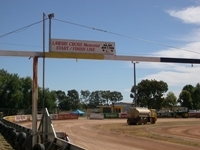 I believe that this is without doubt the most comprehensive Speedway Site on the Net. I could, if I had time, spend hours on it. Seems to cover just about everything apart from the prices of a Burger at my local Track (Redcar). I think that SpeedwayPlus is a GREAT credit to the people who compiled it (how DO they get the time?). It is obviously a labour of love. I would just like to say - KEEP UP THE GOOD WORK - you REALLY ARE appreciated - THANK YOU VERY MUCH." Former Speedway Star editor John Hyam has been carrying out research into the early days at Rye House. He thinks that speedway was first staged at Hoddesdon earlier than accepted wisdom would have us believe. This season this website is sponsoring the Ultimate League in the popular Sim Speedway game. Here's an update on how the season is progressing in this exciting virtual speedway world. Anthony has been a Wimbledon Dons supporter for almost fifty years and these are his favourite seven riders of all-time. There's a real mix of riders here, Buzz Burrows and Ove Fundin both make the cut. Peter Broad is looking for clarification that Lloyd Diamond were once speedway tuners - Can You Help? "Like Keith Burrows I'm a Cradley supporter, but my Mom and Dad took me to Monmore on the 10th October 1969 as a "birthday treat" - (Cradley had finished their home fixtures the previous Saturday). Naturally we shouted for Newport, in particular my favourite ex-Heathen Chris Julian, but the real hero of the night was Sandor who was the only Wasp to win a race. The Flying Magyar contributed 12 from 5 rides out of a 23 point total. He also went on to win the 2nd half so I suspect that could be the match to which Keith refers." "Ken makes a very good argument for the 'speed' in Speedway these days. However my observation would tend to say that bikes have a lot more power these days and therefore the power has to go somewhere. If you look at old time footage of meetings - say 1950's or 60's World finals you will see riders not necessarily fully skidding the bikes like they do today - it was more like a gentle slide and probably due to the deeper grippier tracks then. They would keep the bike straighter thus maintaining their speed rather than 'stopping' like they do today with exagerated slidding. So my comment would be that today's riders are far more 'spectacular' riding wise but probably are losing that extra horsepower through the slicker tracks etc. Otherwise I'm convinced we would see a lot more crashes on grippy tracks - especially the young inexperienced riders that seem to dominate teams today - again rather than yesteryear when it would take you 5 years just to learn to ride a bike - much less race the thing !!" "As I find your site very interesting and looking at pictures of many old tracks that myself and members of my family have visited I see that you do not have photos of Wembley. My late father supported Wembley Lions but Wembley only ever seems to be remebered for football. Many world champions were crowned at Wembley that we will never see at Cardiff in the grand prix." Anybody got any pictures of Wembley in 'speedway mode' that they'd like to share on the site? Geoff Langley pays tribute to his first ever speedway hero, a rider that could have achieved even more in the sport but for injury. All you'd ever need to know about Gary Havelock's 1992 World Final win. Robert Griffin has a number of speedway books that he'd like to swap for programmes or DVDs. Email him at robert.griffin11@btinternet.com for details. "I own the Newcastle History Site and The Defunct Speedway site. I would just like to say I visit your site often and take my hat off to you Speedway Plus is the best general speedway site on the net." "I saw Keith Harvey in action pre-war and he was a really exicting all action rider, especially with his style of leg-trailing around the boards. I remember reading of his retirement in one of my regular speedway mags, it was either the "Speedway News" or dear old Basil Storey's "Speedway Gazette". It supplied the information that he was "going back to South Africe to get married". I also seem to recall that they quoted his age as 54." "Very interesting piece. I seem to remember Barry Meeks being in the Guiness Book of Records back in the early 70s with an average speed at Crewe of around 54mph. Crewe was a very long fast track with banking (around 440 yds when the record was set) so the riders didn't get into that much of a slide to rub off the speed in the corners. I think Ivan Mauger got close with the track record at Exeter, a similar sort of fast banked track. (But there again, I might be making it all up!!)" Ken Nicholson investigates the claim that speedway is now raced at speeds far in excess of those in years gone by. His analysis makes for interesting reading. Pictures of the Undera circuit in Victoria (Australia) this week. The pictures were taken by Howard Williams. If you're visiting a track this summer and taking your camera then we'd be delighted to receive the pictures. The Speedway Riders Benevolent Fund now has a website. The fund received a tremendous boost from the recent meeting at Sheffield. "The superbly talented John Cook was a legendary figure at Ipswich in the 1980s and his madcap antics are what spring to mind when reminising over this time at Foxhall. His complete Witches career comprised of 3 full seasons and 2 part seasons. He messed the management about somewhat and many still question if he really meant to take out team partner Jeremy Doncaster when they were riding to a cup final winning ride against Oxford in 1985. The 7 riders in my Witches dream team achieved more for the club than what John Cook did in my opinion, thats why he isn't included Chris!" "I remember my dad taking me to Wolverhampton one Friday night (a bit of an adventure, we were Cradley fans!) and Sandor rode for Newport. He was pretty much a one man team and I think got 17 from 6 rider after a duck first time out. For me that night he was superb, and he made the Wolves riders look poor, which was great for us, happy days! Anyone know the date? I think it would have been 1969 or 70?" "I remember when Sandor Levai and Zeke Zoltan arrived in the UK after the 1956 Budapest uprising against the Russians. They contacted me at 'Speedway Star' and, as they were then in the Manchester area, I contacted Belle Vue and they had second-half rides in - I think - early 1957. Levai persevered and made the grade in the UK but Zoltan seemed to vanish from the speedway scene. I never found out what happened to him." Teams for the Fans and for the Future of Speedway? Dudley Jones is pleased by what he sees in the 2009 team line-ups, suggesting it's good news for the sport as a whole and Team GB in particular. Will remains a Cradley Heath supporter, even though he was just a young lad when the Heathens last took to the track. He selects some of the greats from the last couple of decades of the sport's history. 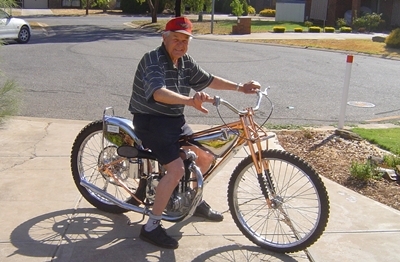 Here's Aussie veteran Lindsay Mitchell astride Jack Young's 1951 World Final bike. Thanks for Neil Burston for the picture. David Hensby has been busy over in Canada. Not only has he revamped photographer Chris Spires' website, he's also built an online 'Track Shop' for Sheffield Tigers merchandise. "A succinct and enjoyable piece about a rider who obviously took many years in a new land to find his way. In many ways, this is why I love speedway and football. Guys who die a death at one club can become heroes at another, and true class often rises slowly to the top." "I first heard of Sandor in Belle Vue & Stoke teams in the 1960's. When he came to the Firs in 1964 he was earmarked to replace George Major, who had been riding for the Stars instead of joining the blacked Provincials like numerous other riders. Sandor obviously gained from riding extra bookings at Rye House as well. He soon settled in at the Firs and proved a popular bloke with the Supporters as well. As said he only scored a few points but he had to "wrestle" his way through to get those. He soon became known as a rider "they didn't mess with" and watching him became as important as watching the Ove way of winning. Although we knew the end was nigh for the "Fabulous Firs" it was still a blow to say goodbye to the Stars like Ove, Billy, Terry, Derek, Trevor, David, Reg and those riders we had come to love over the years it was soon obvious Sandor would be missed just as much. His times with Newport, Belle Vue, Ipswich and Cradley in the next years saw Sandor hit the bigtime as a rider of some repute. I was informed he is now back home in Hungary. I think it was Brian "Mr Birmingham" Buck who put this info on the excellent Birmingham Website. Bryan Tungate - Norwich Stars - 1930 - 1964, The Memories still linger. If the Lord invented anything better than Speedway, He kept it to Himself "
"The programme generator is brilliant, just used it to do a racecard for the meeting I am attending tomorrow afternoon. What a great facility."